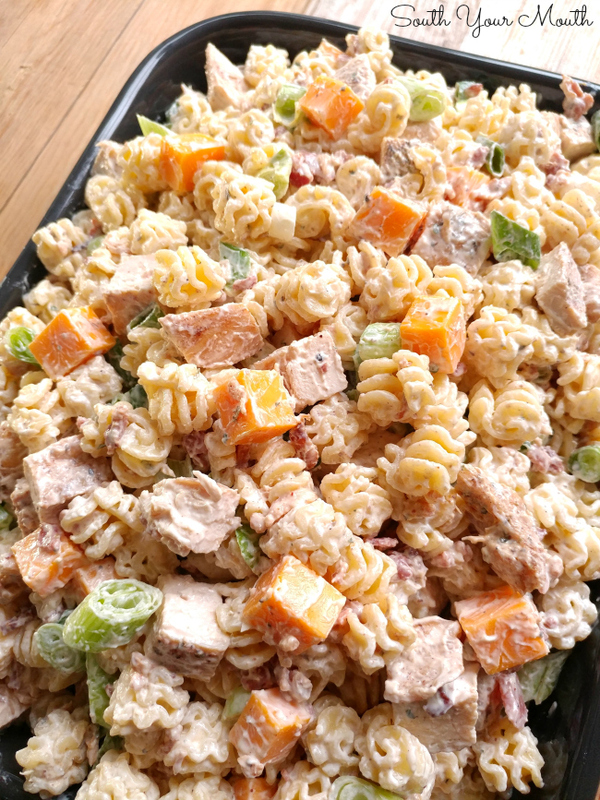 A pasta salad with chicken, bacon and cheddar hearty enough for a meal and perfect for every occasion. Though our fall season is almost over, we spend a LOT of time at the ball field. Between softball and baseball, we’re spending our entire weekend at a tournament at least every other weekend, pretty-much year-round. Seriously, non-baseball/softball parents (or any other youth sport that eats up entire weekends in one giant chomp) look at us sometimes like we’re doing it wrong, like we must be insane to live like this. But y’all, this era my family is in right now has been the best season of my life as a parent. I don’t know if we’re just the luckiest people on earth or if everyone experiences this, but the families we’ve landed with playing ball over the years have become some of our dearest friends. So getting to spend that much time with people I love while watching my kids do the thing they love has been such a blessing. And you want to talk about loving some kids?? SHOOO-WEE!! I didn’t know I could feel this way about a bunch of children that don’t belong to me. MMMMPH… my cup runneth over. OK, back to living life at the ball field… Boy do you get sick of eating sandwiches. And I’ve got some serious tricks up my sleeve for keeping things interesting. I make different types of chicken salad, I assemble all sorts of mini-sandwiches on sweet Hawaiian rolls (egg salad, pimento cheese, seafood salad, etc. ), I make giant subs and cut them into individual servings, I make wraps, etc. but sometimes you just don’t want a sammich. So I decided to make a super hearty pasta salad that would eat like a meal instead of a side dish. And it was a HUGE HIT! This recipe makes a giant batch and we still ate every last bit! You can certainly make this for any occasion (it would be great for showers!) but the way I served this at the ball field was with a stack of small disposable 8-oz plastic tumblers and plastic forks then just let everyone serve themselves. Cut each breast into two thin cutlets. Season cutlets liberally with favorite spices (see below for the combo I used). Add just enough oil to coat the bottom of a large skillet then heat on medium-high heat. Cook chicken for about 4-5 minutes on each side, or until cooked through. Set aside to cool completely then cut into bite-sized pieces. Sometimes I cook chicken just like this for supper too! 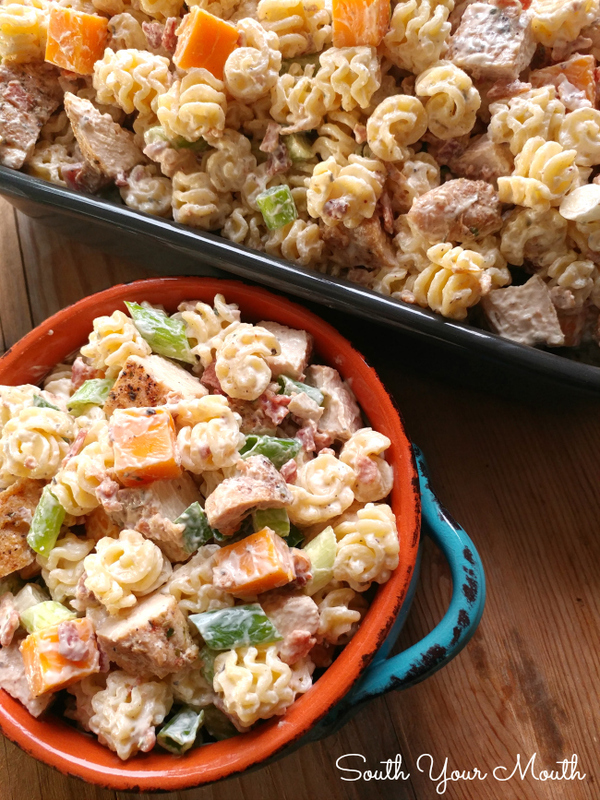 It's super flavorful and cooks up quick! Cook pasta per manufacturer’s instructions for al dente preparation in liberally salted water. Drain, rinse well with cold water then drain again. Set aside. 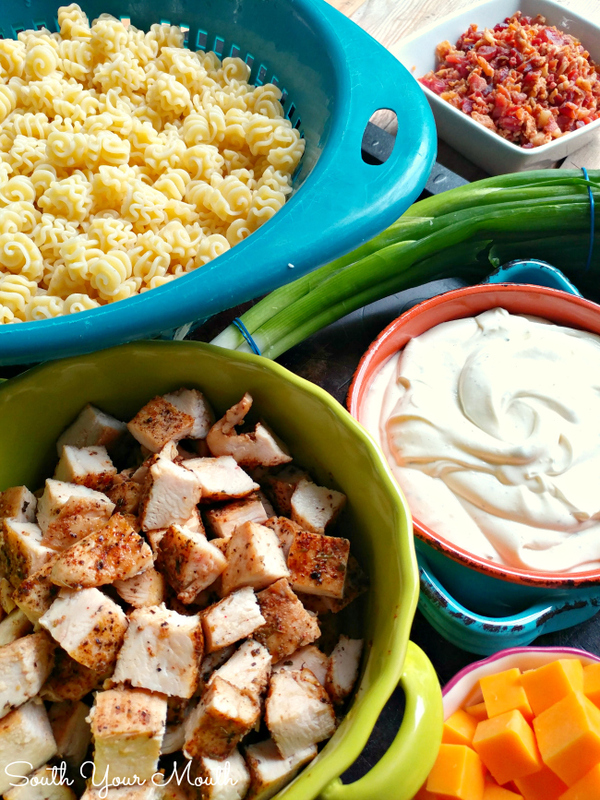 In an extra-large bowl, combine sour cream, mayo and dip mixes then stir well. Add chicken, pasta, bacon and cheese then gently mix until well combined. Fold in green onions. Refrigerate to store in an airtight container. You don’t have to cut your breasts into thin cutlets. I just always do so I have more surface area to season and because they cook quicker and more evenly. 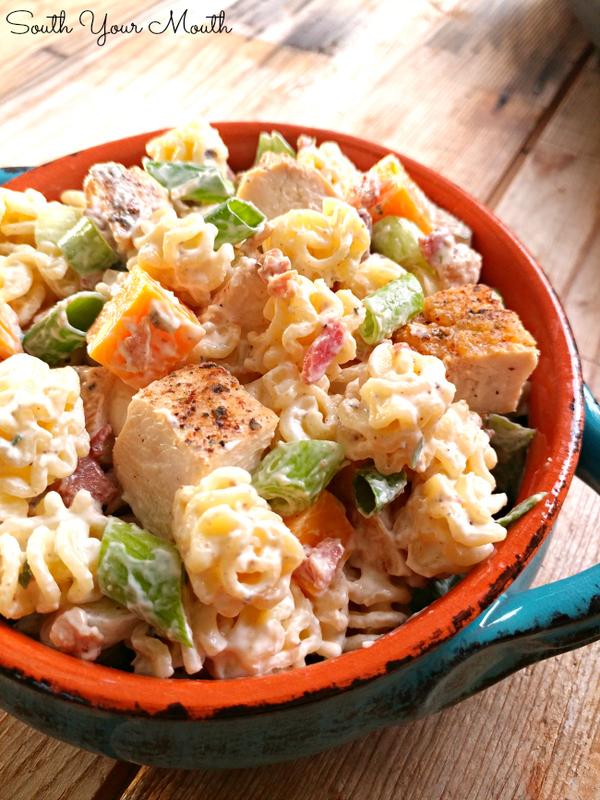 If you’d like your pasta salad to be creamier (or if it dries out overnight) add a little regular ranch dressing. This recipe will easily cut in half if you want to make a smaller batch. 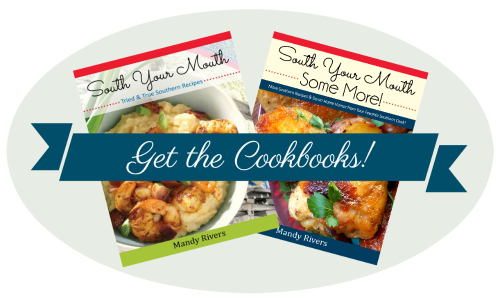 When can we expect another cookbook? I can hardly wait! !